Figs. 1-13. 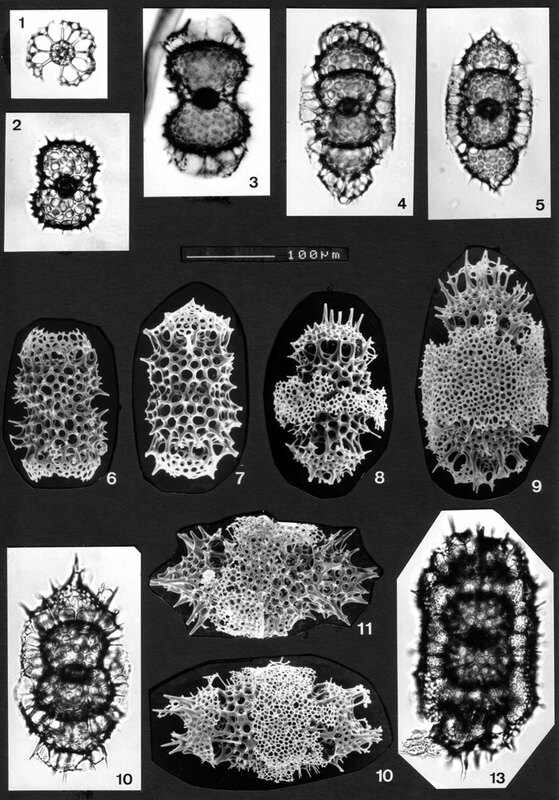 Various forms of Didymocyrtis messanensis. Some morphological variants are due to differences in skeletal development, such as the presence/absence of the first cortical shell (fig. 1, showing only the two medullary shells, in polar view), polar caps (fig. 2 without, all other figures with one or two caps) and veil-like sheath (figs. 4, 5, 8-13). Other differences include the varying shape of the first cortical shell (figs. 2 and 4 show the most common (peanut-shaped) form; in fig. 3 the shell is larger and more like an hourglass); the shape of polar caps (rounded, figs. 8,9, pointed figs. 5, 10, 11, or more irregular, figs. 12, 13; in fig. 4 both rounded and pointed caps are present). Polar spines may be prominent (forma coronata, figs. 11, 12); in most cases, however, they appear to serve as supports for the polar caps (only). Also note how the pores of the outermost veil-like sheath vary from rectangular to rounded, depending on the thickness of the sheath (figs. 8, 9, 11, 12). Specimen identification: Unknown; IOW 134(F); 118(F); 188(F); 188(F); 4x BSS 28B(II); figs. 10-13: BSS 19B(F) EF K55; 28B(VII/1557); 28B(II) and 26B(F) EF K54.